The White House's Office of Science and Technology is currently mulling over a proposal from Caltech scientists that describes a plan to capture a near-Earth asteroid and bring it into the moon's orbit. If approved, the $2.6 billion plan would see the development of a robotic spacecraft that would transport a 500-ton asteroid to the lunar orbit by 2025 where it could be mined for resources and even converted into a base for human habitation. At the same time, it would also offer an unprecedented opportunity to jump-start a mission to Mars — and even launch missions into deep space. The proposal was put together by the Keck Institute for Space Studies (KISS), a group that is investigating the feasibility of identifying, capturing, and returning an asteroid to the vicinity of Earth. The report, a collaborative effort involving scientists from NASA Ames, Goddard Space Flight Center, the Florida Institute for Human and Machine Cognition, and many other institutions, is an effort to explore the ways in which space-based natural resources can be exploited. And indeed, given the tremendous costs of sending material into orbit, it's an idea that makes a lot of sense. Interestingly, the notion of capturing asteroids dates back over a hundred years, but it has only been in recent times that the technology for doing so has been achievable. Specifically, the scientists are banking on three key developments: the ability to discover and identify sufficiently small near-Earth asteroids for capture, the development of a sufficiently powerful solar electric propulsion systems to allow for the transportation of the captured rock, and the ability to host astronauts in cislunar space by the mid-point of the next decade — which would enable both exploration and exploitation of the NEA. To capture the asteroid, a robotic space probe would rendezvous with the object, analyze it for its suitability, capture it (including de-spinning it), and then transport it to lunar orbit (a process that could take as much as six to 10 years). The spacecraft would be powered by solar electric propulsion system, and be launched into space by a single Atlas V-class rocket. And the system is completely scalable, allowing for multiple missions. And as the report suggests, a seven-meter, 500-ton asteroid in high lunar orbit would provide a "unique, meaningful, and affordable destination for astronaut crews in the next decade." The authors suggest that it would be a "disruptive" development in the future of space exploration, a breakthrough that would offer an "affordable path to providing operational experience with astronauts working around and with a NEA that could feed forward to much longer duration human missions to larger NEAs in deep space." It would also go a long way to meeting NASA's goals of sending astronauts to an NEA by 2025. 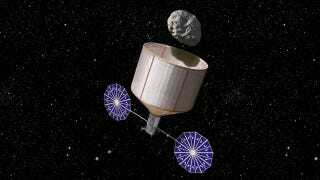 Moreover, the presence of an asteroidal space base could enable human exploration farther out into the solar system. By working in and around such objects, astronauts will be able to extract resources like water or other materials. A volatile-rich asteroid could provide shielding against galactic cosmic rays, while the water could be used for propellant to transport the rocky habitat. And in fact, the idea could spark the development of an entire industry in which devices and spacecraft can be constructed directly in space from these resources. The researchers predict that asteroid capture could provide new opportunities for space exploration not seen since the Apollo missions, describing it as "mankind's first attempt at modifying the heavens to enable the permanent settlement of humans in space."